To build on a groundbreaking study that used brain imaging to identify individuals with suicidal thoughts, Carnegie Mellon University's Marcel Just and the University of Pittsburgh's David A. Brent have received a five-year, $3.8 million grant from the National Institute for Mental Health (NIMH). The grant will be used to advance Just and Brent's previous research and establish reliable neurocognitive markers of suicidal ideation and attempt. They will examine the differences in brain activation patterns between suicidal and non-suicidal young adults as they think about words related to suicide — such as positive and negative concepts — and use machine learning techniques to identify neural signatures of suicidal ideation and behavior. "The cornerstone of this project is our recent ability to identify what concept a person is thinking about based on its accompanying brain activation pattern or neural signature," said Just, the D.O. Hebb University Professor of Psychology in CMU's Dietrich College of Humanities and Social Sciences. "We were previously able to obtain consistent neural signatures to determine whether someone was thinking about objects like a banana or a hammer by examining their fMRI brain activation patterns. But now we are able to tell whether someone is thinking about 'trouble' or 'death' in an unusual way. The alterations in the signatures of these concepts are the 'neurocognitive thought markers' that our machine learning program looks for." 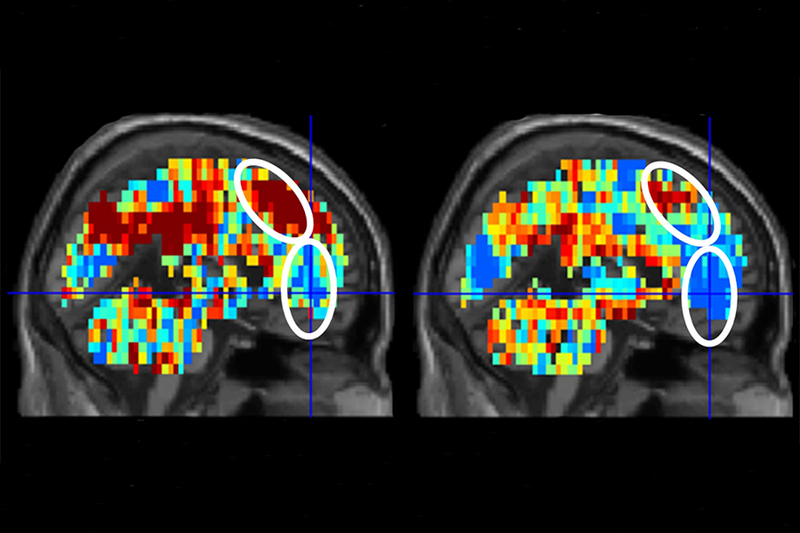 The new funding will support the Predicting Risk Imaging Suicidal Minds (PRISM) project. It will enable Just and Brent to test the technology in a much larger sample of patients than in the 2017 study, and to include a variety of comparison patients with other psychiatric illnesses. Develop personalized treatment strategies for their suicidal patients based on their altered patterns of thinking and feeling that can more precisely and effectively reduce suicide risk. "Suicide is the second leading cause of death among young adults in the U.S., and current assessment methods rely entirely on patients self reporting and doctors' observations," said Brent, who holds an endowed chair at the University of Pittsburgh School of Medicine. "Any new inroads to better diagnosis and treatment have the potential to save lives." Learn more about how Just and Brent used brain imaging to identify individuals with suicidal thoughts. Researchers led by CMU's Marcel Just and the University of Pittsburgh's David Brent have developed an innovative and promising approach to identify suicidal individuals by analyzing the alterations in how their brains represent certain concepts, such as death, cruelty and trouble.